Clinic Synopsis: The goal of this workshop is to bridge the gap between traditional understanding of jazz and classical music. The Chicago Jazz Philharmonic’s brass section, led by trumpeter/conductor Orbert Davis, will demonstrate the similarities and differences of each genre and how to fuse the two together effectively to create new and inspiring music, called "Third Stream." Attendees will learn about the importance of cultivating "inner diversity" to achieve true diversity in music and in life. 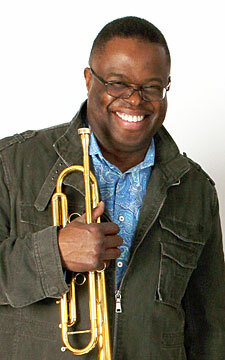 Clinician Biographical Information One of Chicago's busiest and most sought after musicians, jazz trumpeter, composer and conductor/artistic director of the Chicago Jazz Philharmonic (CJP), Orbert Davis was named by Chicago Magazine as "Y2K's Best Trumpeter in Chicago" and chosen as one of seven "Chicagoans of the Year for 2002." Most recently, he was the 33rd Annual Chicago Jazz Festival’s ‘Artist-in-Residence’ where he led his ensembles of various sizes (Quartet to Chamber Ensemble) in numerous performances. The Chicago Jazz Philharmonic, a 57-piece orchestra presents music that bridges jazz and classical genres, is his largest and most ambitious ensemble--the only Third Stream orchestra of this size in the United States. Orbert is clinical associate professor of jazz at the University of Illinois at Chicago, where he also directs a two-week music camp in partnership with Chicago Jazz Philharmonic.